Close to 67% of Romanian households (roughly 7,5 million) are connected to water supply systems and 65% to sewage systems, according to ErdélyStat, which used the 2011 census data for the report. The Eurostat data about the percentage of population connected to public water supply from 2015 reflects similar results. Alongside the Bucharest region, Transylvania and Banat shows advancements in this sector: 77% of Transylvanian households are connected to water supply systems and 75% to sewage system, which compares to Havasalföld/Tara Romaneasca/Muntenia and Moldova where only half of the total registered households are connected. As for the houses having a toilet inside the building Transylvania is above the average with 71%, and kitchen with 88%. The average for Romania is 62% and 85%, respectively. Households connected to water supply and sewage systems in Transylvania, Banat and Partium. The biggest advancements in terms of water supply and sewage systems are in the south part of Transylvania and Bánság/Banat. 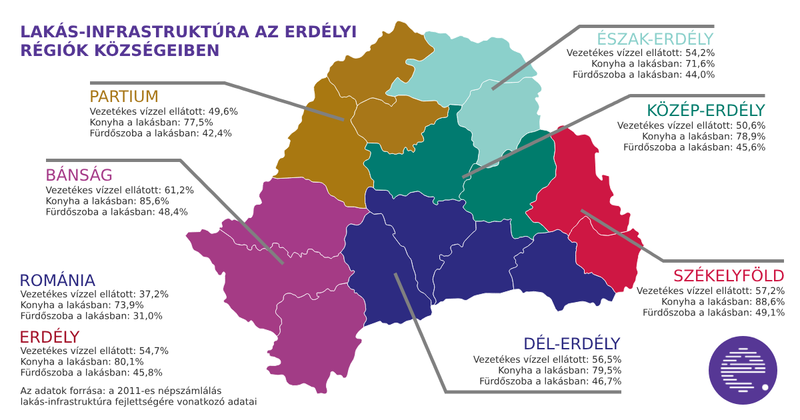 Székelyföld/Szeklerland is above Romania’s average with 73/% household connected to water supply systems and 70% connected to sewage systems. Also, Szeklerland registered the highest rate for households with a kitchen both in rural (89%) and urban (96%) areas. The Partium region is falling behind with only 50% of households connected to water supply and sewage disposal systems. The highest rate was recorded in the Bucharest-Ilfov region with 90%, and the lowest in Moldova with 53% and 51%, respectively. Havasalföld/Muntenia is at 56% and 55%, respectively, falling behind both the Transylvanian and the country’s average. When looking into counties, the highest advancements was registered in Brassó/Brasov (90%), Temes/Timis (85%), Constanta (85%), Hunyad/Hunedoara (84%) Szeben/Sibiu (82%) and Kolozs/Cluj (81%). There are nine counties in Romania where not even half of the households are connected to water supply and sewage system and of them three counties – Vaslui, Olt and Botoșani – don’t even reach 40%. By comparison, 99% of the Dutch population and 95% of Austrians live in households connected to sewage systems.